This morning I decided I needed to exert the extra effort and make it to mass. I crept into the kids' bedrooms and whispered to each of them that it was time to get up, and that I was going to church and who wanted to come with? Petey jumped right out of bed and got dressed. With three kids almost exactly the same age, special one-on-one time is hard to come by. We go to church every week, but he's never been on a weekday morning. He kept tugging my hand, asking me where the music was, why was it so dark, why didn't I bring the bag with his books in it? And after a while, he quieted down and just looked around with his big hazel eyes. I was glad he had the chance to see the church at a quiet time - not full of his friends, music, and lots of distractions, but stripped down to the essentials. We held hands a lot and just let the peacefulness seep in. And then on the way home, I sang him "Brother Sun, Sister Moon" and "The Prayer of Saint Francis" in honor of All Saint's Day. 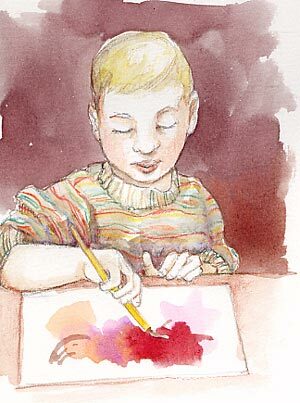 We painted together this afternoon; this is Petey as he sat across from me creating his beautiful watermelon-y washes.